East and westbound travellers approaching Sackville on the TransCanada Highway will soon see billboards showing a photo of the Waterfowl Park and advertising a new kind of small town on one sign while the words “Home of Mount Allison University” will appear on the other one. The two signs, expected to be installed within a month and a half, will replace ones from 2014 that depicted the Farmers Market at its former home on Bridge Street. One of those billboards on the eastbound lanes near the Walker Road exit was destroyed last winter when a tractor trailer smashed into it during a snow storm. Replacing it will cost about $36,800, but the town expects to recover all of the money from the trucking company’s insurance. Design costs and replacement of the westbound sign will amount to about $4,200. The billboard photo was taken by Terry Danks of Chester, Nova Scotia. During Monday’s town council meeting, Councillor Megan Mitton said the new image is appropriate because the Waterfowl Park is an important feature of Sackville that motorists glimpse as they drive by on the TransCanada. “It also seems fitting to feature the Waterfowl Park as this year, we’ll celebrate its 30th anniversary,” Mitton added. She said planning continues for events on Saturday June 16th to celebrate the park’s anniversary. Also, during last night’s meeting, councillors agreed to consider changing the town’s zoning bylaw to permit construction of an Ambulance New Brunswick station on Robson Avenue near the Westmorland Animal Hospital. The Nova Scotia company, Parsons Investments, is in the process of buying two chunks of land that border on Robson, Cattail Ridge and Bridge Street from Sackville businessman Percy Best. Parsons wants to build the station on about half an acre and lease the building to Ambulance New Brunswick. Parsons already owns the ambulance station in Amherst. Councillors heard last night that the company now plans to build the station 50 feet from the road, the same distance as the animal clinic, instead of the 70 foot setback in its original plan. Councillor Mitton said she favours the project because it would move the station out of the industrial park where ambulances could potentially be blocked by a train during an emergency. She added that since the station would be on Robson, it would not interfere with a pedestrian-friendly streetscape on Cattail Ridge envisioned in a $27,000 plan put forward by Ekistics Planning and Design of Dartmouth. Council passed a resolution at last night’s meeting setting April 9th as the date for a public hearing on the rezoning application. Council was told that a safety system has been installed at the Tantramar Veterans Memorial Civic Centre arena to warn of an ammonia leak from the ice-making system. 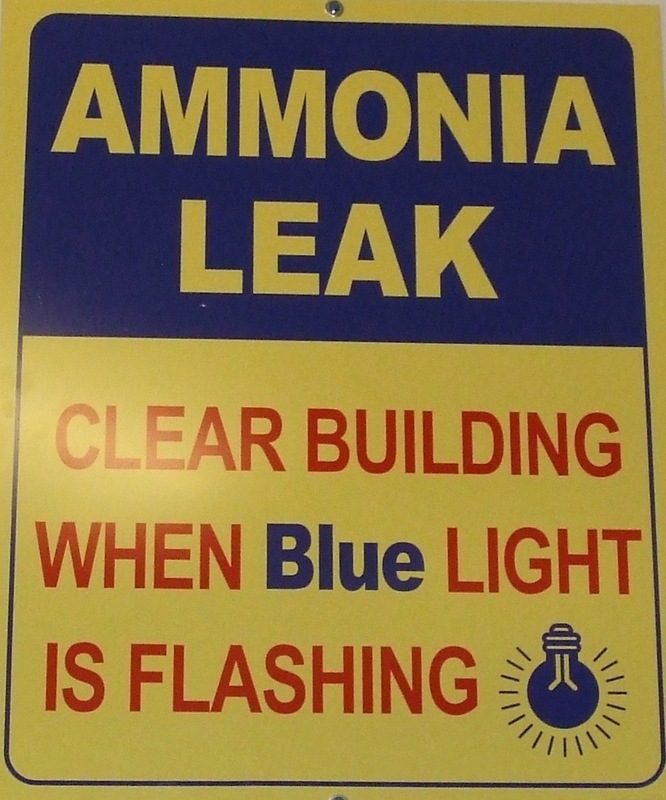 A blue light and a horn, connected to an ammonia sensor, have been installed under the score clock. The light will flash and the horn will sound if the sensor detects the colourless gas that can be fatal if it’s inhaled. Last October, three workers died while performing routine maintenance at an arena in Fernie, B.C. Town Engineer Dwayne Acton told councillors that signs have been installed at the Civic Centre telling people to leave the building immediately if the alarm system goes off. He said the town acted before being required to do so by the province. (1) Councillors were told that the New Brunswick Department of Transportation and Infrastructure (DTI) has committed its share of funds to reconstruct 300 metres of Main Street between Union Street and Queens Road. The town plans to reconstruct the entire roadway replacing curbs and gutters, sidewalks and utilities, including a new storm sewer. The province will pay $411,ooo for curb to curb reconstruction with a $73,000 (15 per cent) contribution from the town. Since the total cost of the project is estimated at $856,000, the town will pay an additional $372,000 to complete it as shown in the chart below. (a) Mayor’s annual salary: $9,589.84 (taxable portion) with an allowance of $4,794.92 (non-taxable portion) for incidental expenses, for a total of $14,384.76. (b) Deputy mayor’s annual salary: $5,676.84 (taxable portion) with an allowance of $2,838.42 (non-taxable portion) for incidental expenses, for a total of $8,515.26. (c) Councillors’ annual salaries: $5,037.24 (taxable portion) with an allowance of $2,518.62 (non-taxable portion) for incidental expenses, for a total of $7,555.86. (d) Beginning January 1, 2019, salaries and allowances will be adjusted every year by an amount equal to 90% of the average increase in the Consumer Price Index, not to exceed 3%. (e) Each mayor, deputy mayor and councillor is permitted to join the town’s life, health and dental plan in accordance with the carriers’ rules and regulations. If a member of council chooses not to become a member of the town’s plan, he or she will be permitted to receive re-imbursement of premiums paid to a private carrier (excluding deductibles paid for drugs, dental, etc.) up to a maximum annual cost of the town’s life, health and dental plan. For further information on meal expenses, mileage allowances as well as the requirement for public expense and meeting attendance reports, click here. This entry was posted in Town of Sackville and tagged Ambulance New Brunswick, highway billboards, Parsons Investments, Sackville Waterfowl Park, Tantramar Veterans Memorial Civic Centre, Terry Danks. Bookmark the permalink. 1. This picture of Sackville is beautiful (thanks to Artist Terry Danks). 2. Is the following considered too expensive for 300 metres only? I cannot help not to wonder. “(1) Councillors were told that the New Brunswick Department of Transportation has committed its share of funds to reconstruct 300 metres of Main Street between Union Street and Queens Road at a total cost of $856,000. The province will pay $411,000 while the town covers the remaining $445,000”. The good news here is the help from the Government….I wonder what sort of a re-construction project? Is it considered a major re-construction or a routine project after winter(s)? When will the work take place and for how long? Perhaps the damage is too important (water-related, etc.) or the costs of asphalt are too high? Many thanks Bruce (Mr. Wark) for the explanation and for the link. This sounds great! Thank you for keeping us informed. If I may say this like this: Your articles talk to us (they even respond :). You also give us a platform to ask questions and understand issues. In addition to keeping us informed, you bring Sackville people together around the discussion of our issues. By doing so, as citizens, somehow we feel even more connected to *Sweet little Sackville* and its surroundings. For this, I will say thanks again. Item 3 – this council not only voted on their current renumeration but also setup automatic raises every year without going to the voters first??? Not showing much fiscal restraint. The article prodded me to watch the council meeting video. Apparently the new renumeration bylaw is consolidating other documents and the annual cost of living increase was already in place! Granted the dollar values are small but.. Thank you Bruce for providing such a prompt and thorough ‘high-point’ review of the Town Council meeting on Monday night. Certainly looking forward to hopefully having more of the same in The New Wark Times in the future.